My favorite aisle at Barnes and Noble is the International Cookbook aisle. Lately I have browsed Lebanese, Turkish, and Portuguese cookbooks. And more recently, I looked over 3 different cookcooks about Spain. I love tapas! It's my favorite way to eat: small dishes of different selections with a glass of wine. The tapas bar tradition of small bites of food with your drink is a great way to experience dfferent flavors without filling up. I was asked to tell about myself prior to a President's Club trip with King Pharmaceuticals (now Pfizer), and one of the questions was what my favorite food was. I said tapas. And so at our Awards Ceremony evening, we had servers walk by with small bites of food as we visited with each other over wine before we were seated at our tables at the castle in Budapest. It was one of the most memorable evenings of my life. This recipe came about as I pored over the cookbooks of Spain on Saturday. 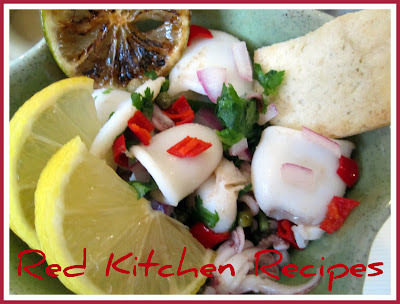 They had so many recipes with calamari, which I love. But with the humid Arkansas weather that we were having this week, I really craved something with more of a fresh, Mexico flair. Ceviche. But not really. Rather than rely solely on the lime juice to cook the squid, I blanched it. 1 package of Private Selection Calamari (already cleaned!) 16 oz. Bring a pot of water to a boil. Drain the calamari and add to the pot for about 3 - 4 minutes, or until the edges start to curl a little. Remove, and add to an ice bath (a bowl of water with ice). Mix all the other ingredients. Add the calamari. Let sit for about 20 minutes, and serve with tortilla or pita chips.